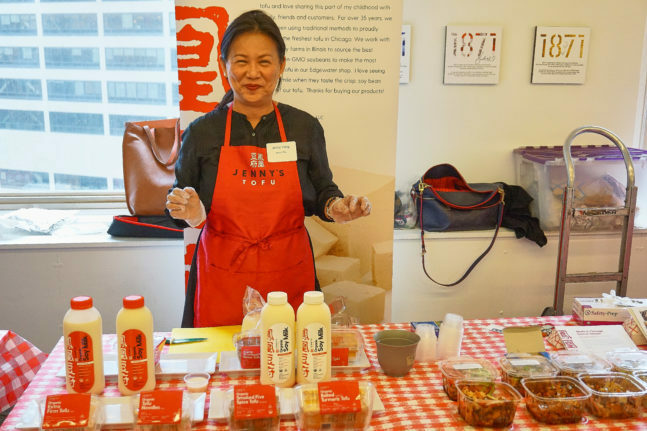 FamilyFarmed’s Good Food Business Accelerator (GFA) staged its annual Application Celebration and Networking Event at Chicago’s 1871 business incubator on Tuesday. It included a panel of four GFA graduates moderated by Scott Mandell, a program “supermentor” who founded hugely successful Enjoy Life Foods. 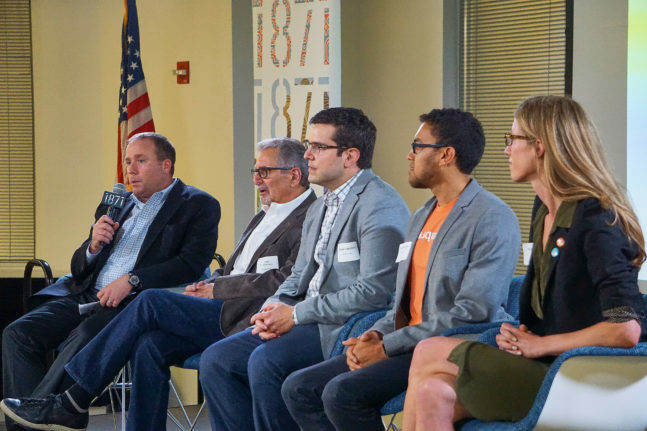 “When we came to the Accelerator, in the vetting process, I was asked, ‘What is it that you don’t know?’ And my response was, ‘I don’t know what I don’t know. 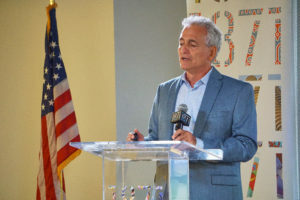 If I knew what I didn’t know, I wouldn’t be here,'” said Mitch, whose suburban Chicago company produces probiotic-rich, clean-label pickled vegetables and condiments. Mitch continued that his knowledge gaps were filled in by the six-month program, which provides an intensive curriculum, industry-leading mentors and guest lecturers, networking with Chicago’s Good Food business and finance communities, and opportunities to pitch and present their products at FamilyFarmed’s annual Good Food Financing & Innovation Conference. 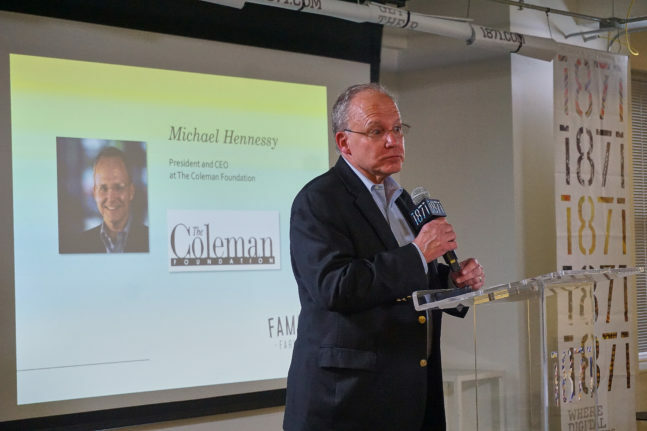 Among his most important takeaways were supply chain solutions, which have led him to source more of the vegetables he uses from Michigan farms local to the Chicago foodshed. The Accelerator certainly enables its Fellows to access a broad community of Good Food business leaders. This was underscored by Megan Klein of HERE Foods, whose cold-pressed juices and dips, made from local ingredients, already are on the shelves of 175 stores just six months after the company officially launched at FamilyFarmed’s 2017 Good Food Festival. 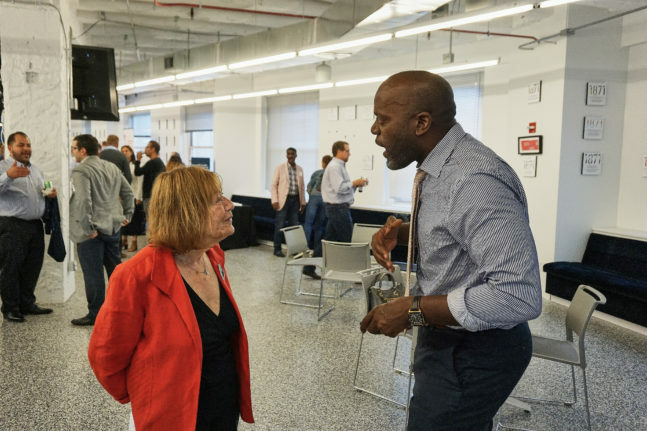 “The quality of the supermentors in the program is really incredible,” said Megan, whose own supermentor is Dave Donnan, the global food and beverage sector lead for the A.T. Kearney management consulting firm. And this bonding and sense of community among the Fellows is a point that graduates come back to time and again. “It’s a great asset to talk freely, openly and be vulnerable to other business owners — ‘This is a problem that I’m having, this is how I’m going to go about solving it, what do you think’ — and get really valuable, honest feedback,” Jordan said. The Fellows panel followed introductory remarks by Family Farmed Board Chair Charlotte Flinn and a presentation by Jim Slama, FamilyFarmed’s founder and CEO, about the organization’s wide-ranging efforts to advance the Good Food movement; remarks by Michael Hennessy, president and CEO of The Coleman Foundation, which is providing FamilyFarmed with a $125,000 grant to build its capacity; and a keynote speech by Anubhav (Anu) Goel, Executive Vice President of Client Growth Solutions at SPINS, the leading provider of retail consumer insights, analytics reporting, and consulting services for the Natural, Organic, and Specialty Products Industry. Anu’s insightful presentation on Good Food market trends and entrepreneurial opportunities will be the subject of a follow-up article on Good Food on Every Table. This entry was posted in Food and community, Food Artisans, Food education, Food Entrepreneurs, Good Food and economic development, Good Food Business Accelerator, Good Food business development, Good Food marketing, Good Food Success Stories, Healthy snack foods, Local Food, Natural food and products industry, Supply chain, Sustainable food business investment, Sustainable food retailing, Value Added Products and tagged 1871 Chicago, A.T. Kearney, business accelerators, Dave Donnan, Enjoy Life Foods, FamilyFarmed, Fillo's Sofrito Foods, Food business accelerators, Full Belly Foods, Good Food Accelerator, HERE Foods, Jim Slama, SPINS, Tea Squares, The Coleman Foundation. Bookmark the permalink.